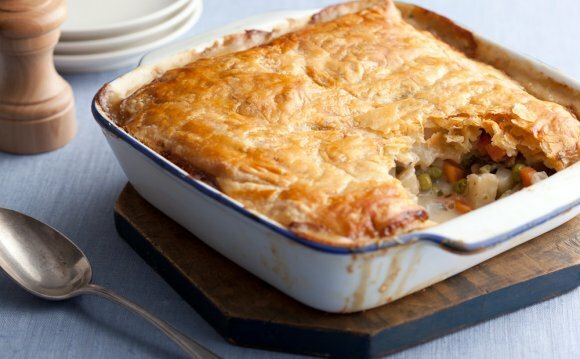 Scrumptious, flaky, veggie-packed vegan pot pies in under one hour. That’s all that you should know. OK, maybe it is not All that you should know. I can’t talk that little – you will know much right now. These pot pies come before extra-chilly winter days. They’re warm, wealthy, comforting, entirely vegan making directly from scratch. I’m so in to these at this time. The filling all comes together in a single pot within twenty minutes. While it’s being applied away, thickening into liquid gold, create a batch of my favorite Damn Vegan Biscuits! Alternatively, top all of them with cake crust or commercially made biscuits. I simply like making mine myself because there’s truly nothing better. Total prep time on these men is all about 35 minutes plus they bake in about 15. I’ve considered them the “1-hour vegan pot pie” despite the fact that they most likely require rather less. However with cleanup time incorporated that’s most likely better. Besides, you will be super impressed on your own when they’re completed in forty-five minutes and also you seem like a pot cake wizard. You’re welcome. Your cold winter bones are aching with this dish, I'm able to sense it. Enjoy! Easy, 1-hour vegan pot pies packed with vegetables and capped with flaky, from-scratch vegan biscuits! Pre-heat oven to 425 levels F.
Add 2 Tablespoons of essential olive oil to some large soup pot over medium warmth, adding onion and garlic clove along with a pinch of salt – stir. Prepare until soft – about 7 minutes. Add some flour and stir having a whisk, then gradually whisk within the broth. Add almond milk, bay leaves and stir. Simmer before the mixture is thickened (about ten minutes). Whether it still seems too thin, scoop out 1/2 cup from the broth and add 1-2 Tablespoons of more flour and whisk. Add into the pot to thicken. Wait a couple of minutes, then repeat if required. As the sauce is thickening, prepare biscuits (if using). Eliminate, leave unbaked, and hang aside. When the sauce is thickened, add some frozen veggies and prepare for 4-5 more minutes. Taste and adjust seasonings, adding more pepper and salt as needed. Discard the bay leaves and divide the mix evenly between 5-6 gently greased ramekins or perhaps a 8×8 baking dish. Top with vegan biscuits and brush the tops from the biscuits with melted vegan butter. Set your 8×8 dish or ramekins on the baking sheet to trap overflow and bake before the biscuits are golden brown and also the filling is bubbly (about 14-17 minutes). Let awesome for five minutes before serving. If making in advance, simply spoon the cooked veggie mixture to your ramekins or dish, top with uncooked biscuits, and freeze. When prepared to prepare, pre-heat oven to 425 levels and prepare before the biscuits are golden brown and also the mixture is bubbly – roughly 20-half an hour. *This recipe could be easily modified to incorporate chicken. Simply include 1 chicken white meat cubed as the sauce is thickening before you decide to add some vegetables. Just make certain it’s cooked completely through before investing in ramekins for baking.